The other day on our weekend gateway, Liem randomly suggested we go to local antique market mall and browse around. Sweetest. These are the goodies I found. 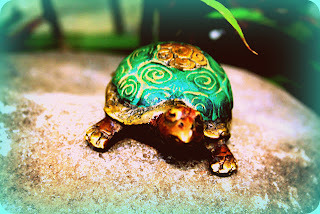 The cool vintage turtle which is in my opinion is super cute! It has 4.5 inch long and will be perfect to be placed in the living room. Thank you Liem for the fun random outing. we still have other vintage finds and I will post the picture soon.